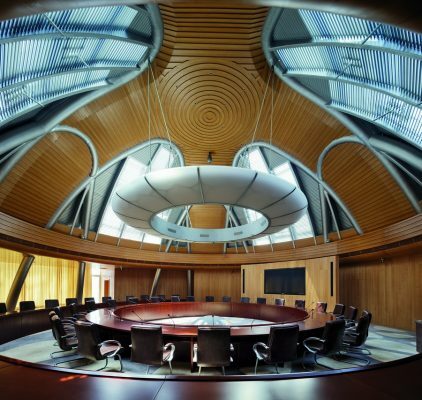 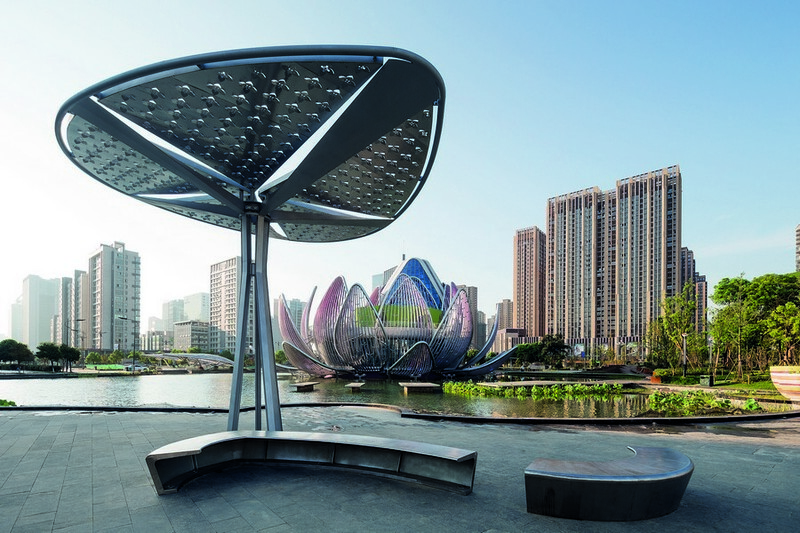 Located in the heart of Wujin, the burgeoning southern district of Changzhou, Jiangsu PRC, the Lotus Building and the 3.5 hectare People’s Park has been designed to act as a cultural anchor and civic landmark – establishing a symbolic commitment of the local government’s ambitions and future aspirations. 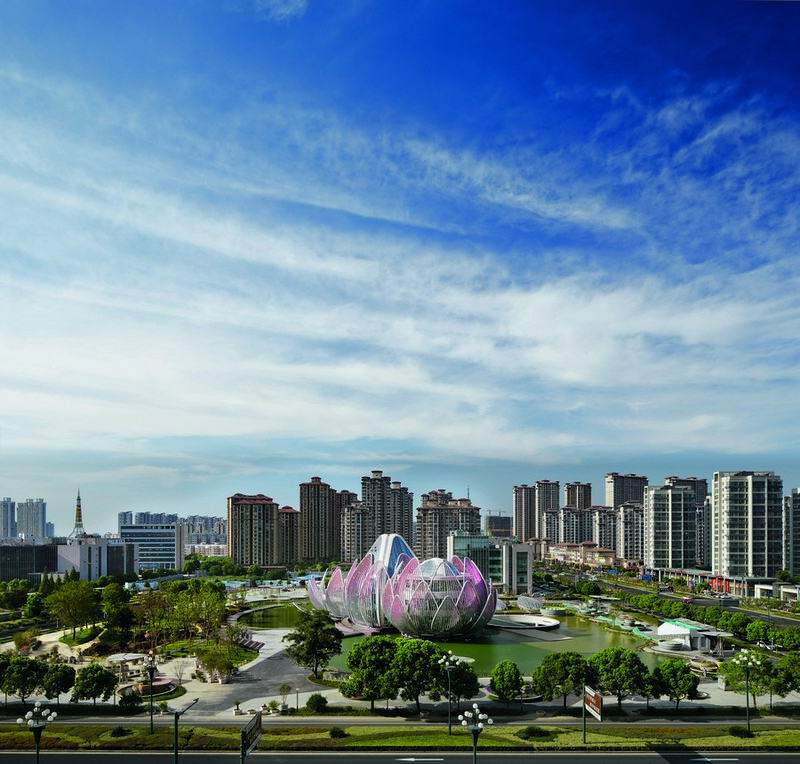 The brief called for a public building and park that would embody a unique variety of civic nodes and public spaces. 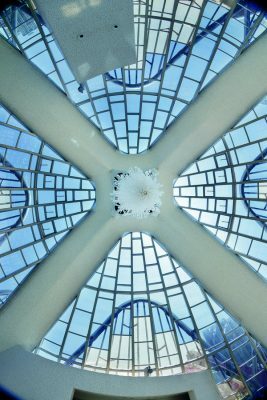 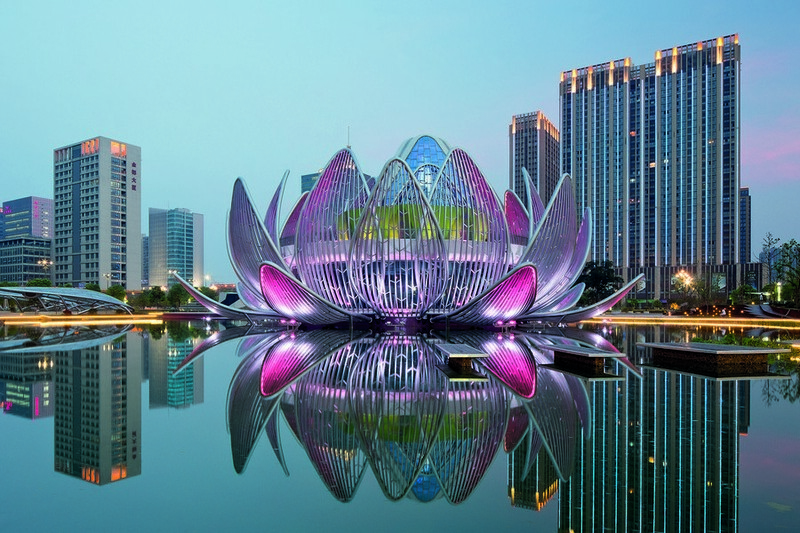 The Lotus Building is an addition to an existing double storey subterranean municipal facility situated beneath an existing artificial lake. 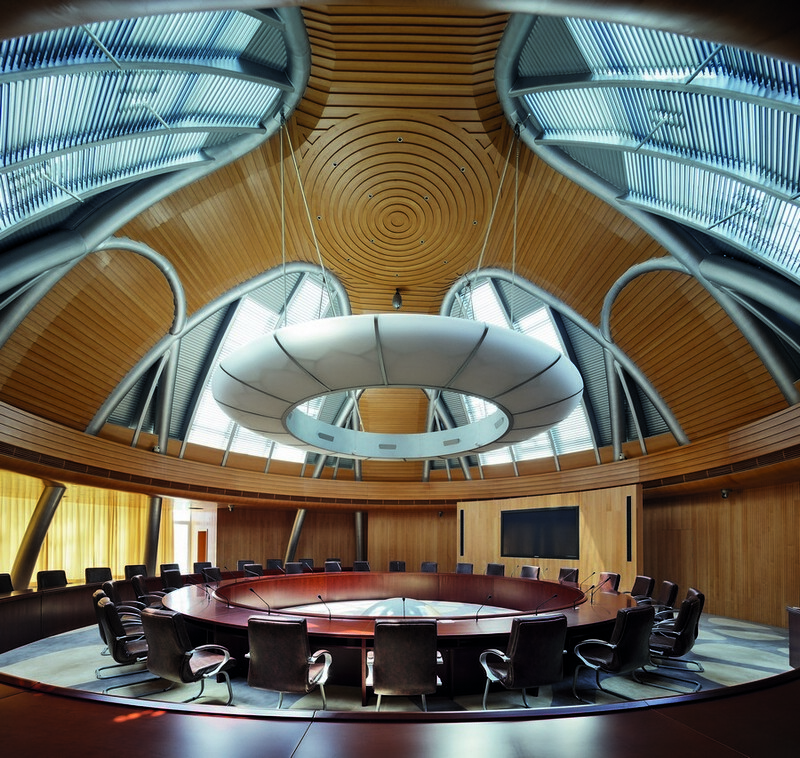 The building houses parts of the planning bureau as well as new exhibition halls meeting rooms and conference centres. 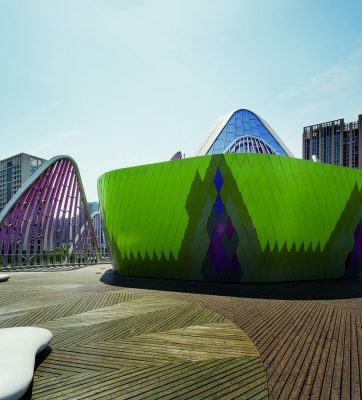 The physical form of the building has been determined by the need to create a structure which has a distinctive presence; a character piece in a city can be in parts anonymous like so many other rapidly developing Chinese cities. 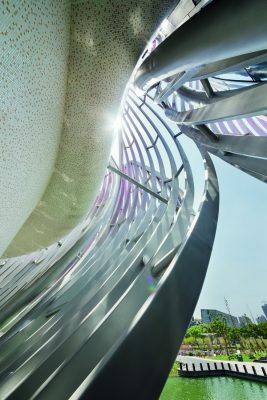 The development, ultimately, seeks to generate participation, to build an ownership of place that builds ties to the community and entices its people to stay and flourish and not to be drawn away. 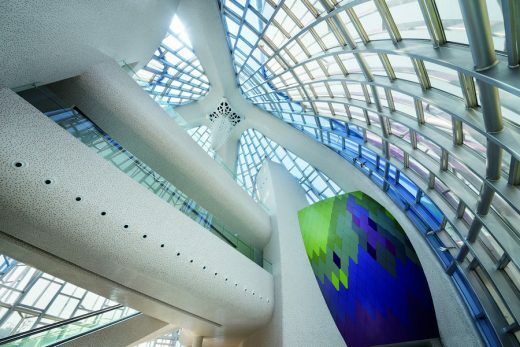 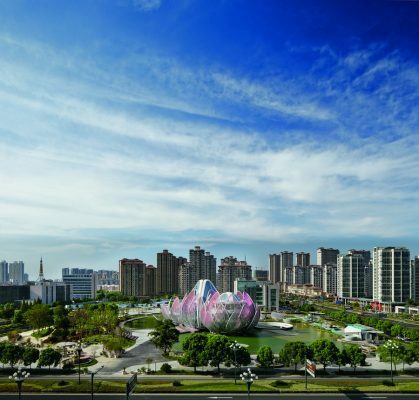 This landmark aims to bring longevity and depth to the community; to set a new standard for architectural ambition in the area and stimulate further urban development. 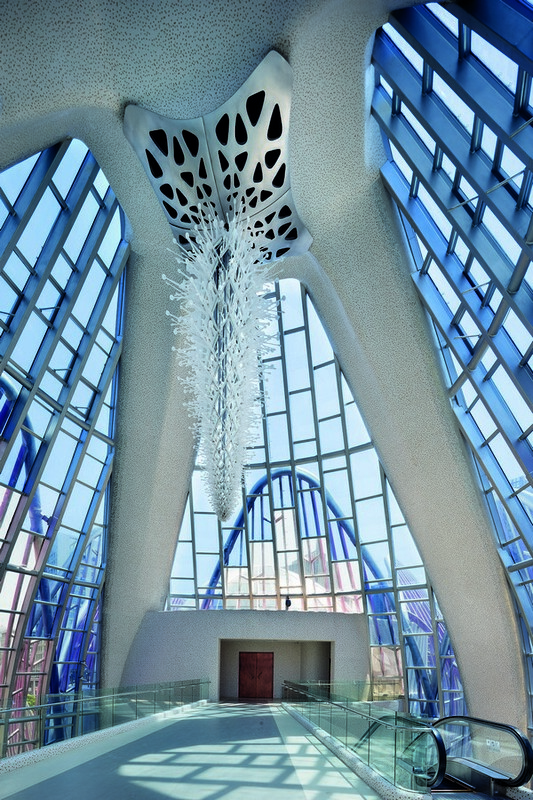 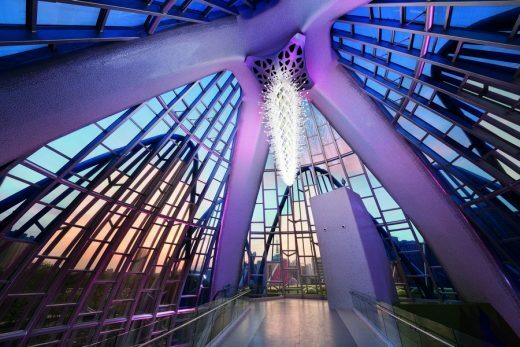 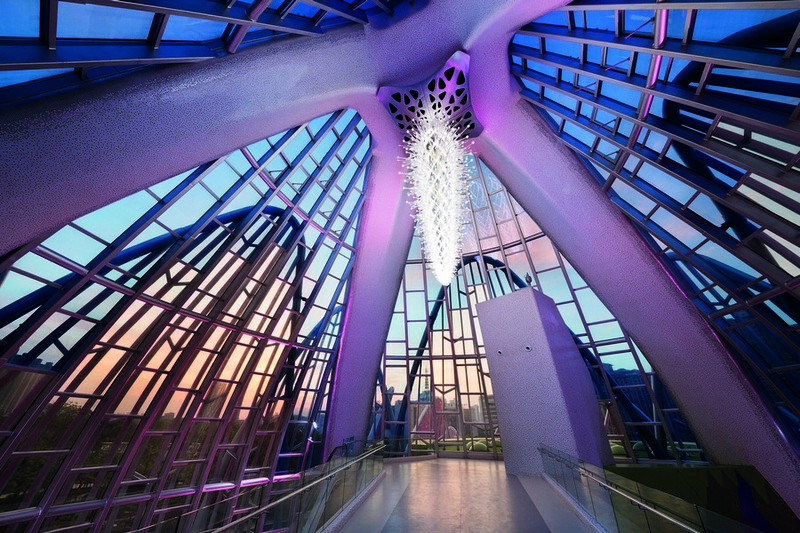 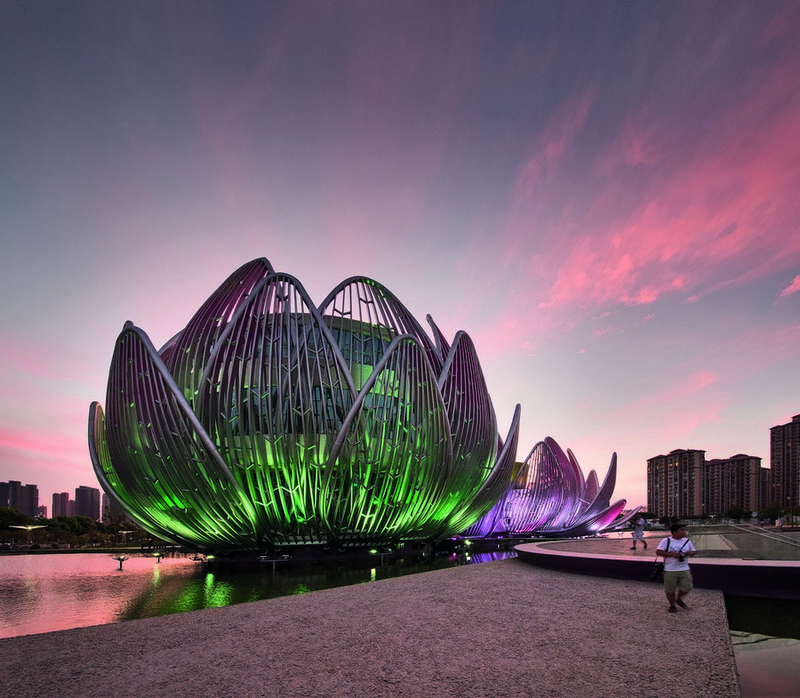 Conceived as an inhabited sculptural form, emerging naturally from the lake; the visitor enters from beneath and is greeted with a cathedral like revelation of space. 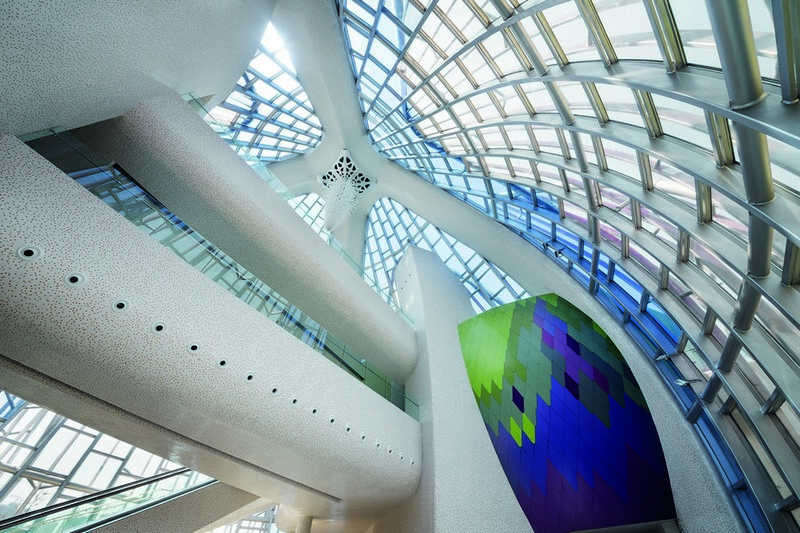 Colour and light combine and illuminate, creating a bright and uplifting interior atmosphere, no matter the weather. 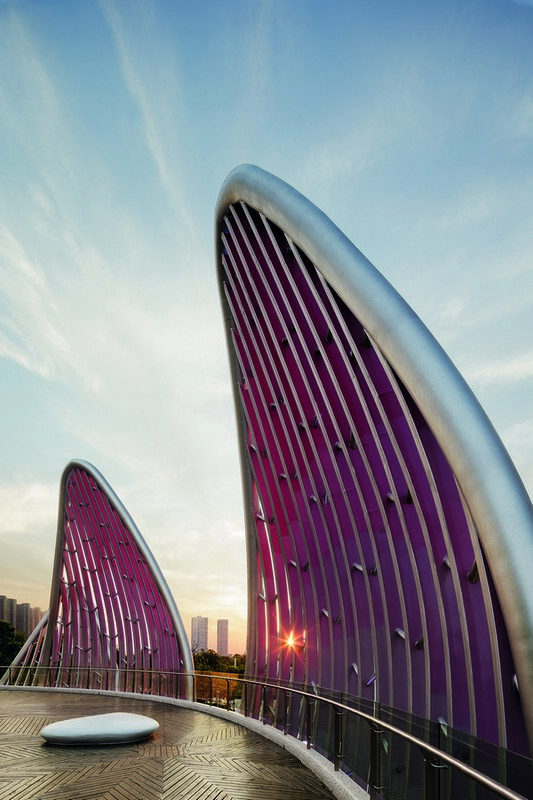 Transitioned and graded colour is applied to the side of the petal ribs, creating a deep hue only at the edge of the structure. 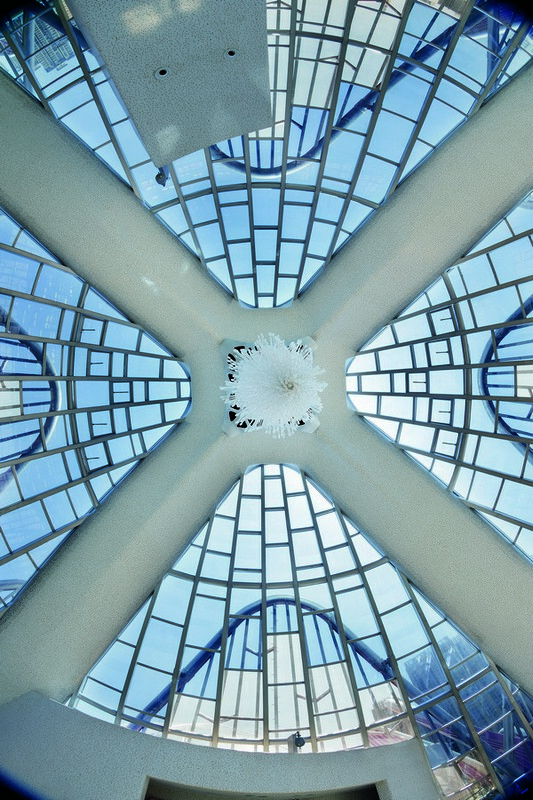 Hand laid and varied white, beige and stainless steel hexagon mosaic tile finishes cover all external and internal surfaces; merging seamlessly to create a continuous form with studio505’s bespoke 7m high suspended chandelier at the apex, becoming the focus of attention, inside and out. 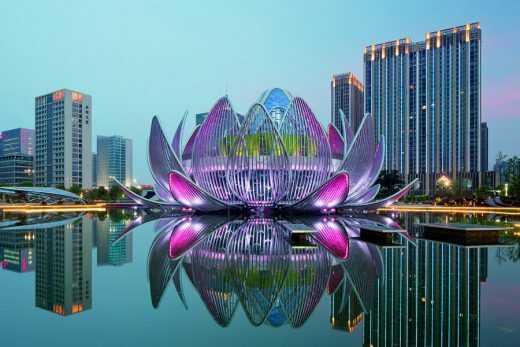 The project has been designed to minimise energy usage- with over 2500 geothermal piles driven through the base of the artificial lake, The entire lake water mass and ground beneath is utilised to pre-cool (summer) and pre-warm (winter) the air conditioning systems for both the lotus and the two storey building beneath the lake. 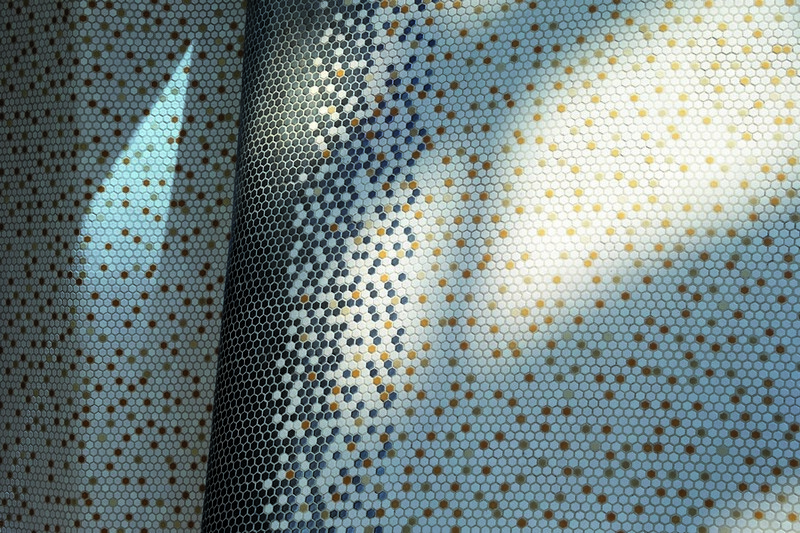 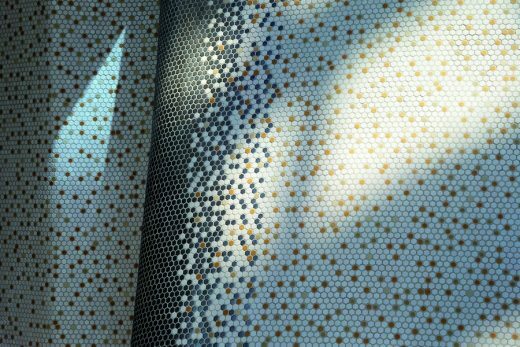 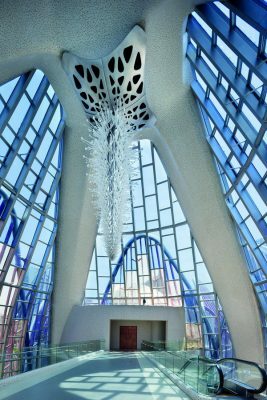 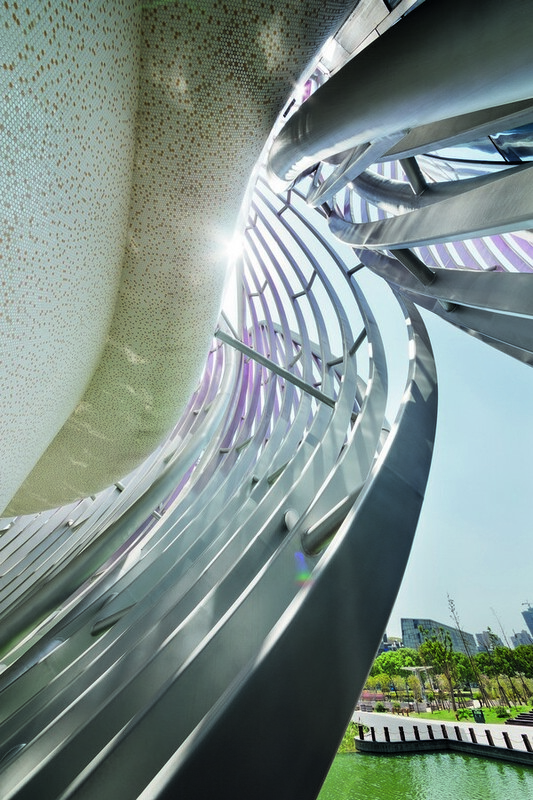 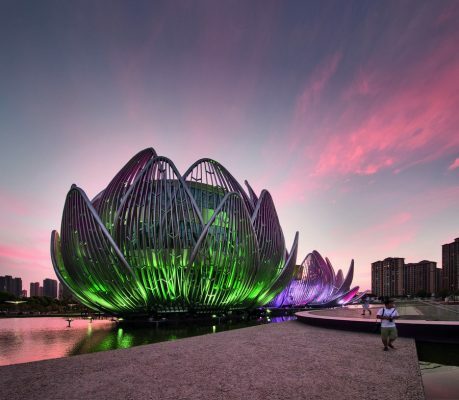 The project is also mixed mode and naturally ventilated and utilises evaporative cooling from the lake surface to drive a thermal chimney within the main flower pod. 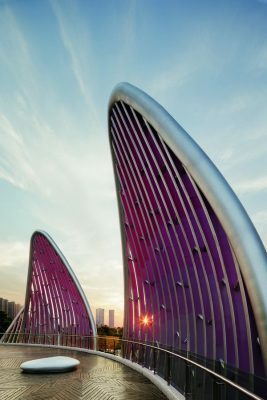 Studio 505’s design creates a vibrant public realm; key to which is a night lighting system devised to hold a series of changing natural colour combinations for 20 seconds before slowly transitioning to the next scene over 10 seconds. 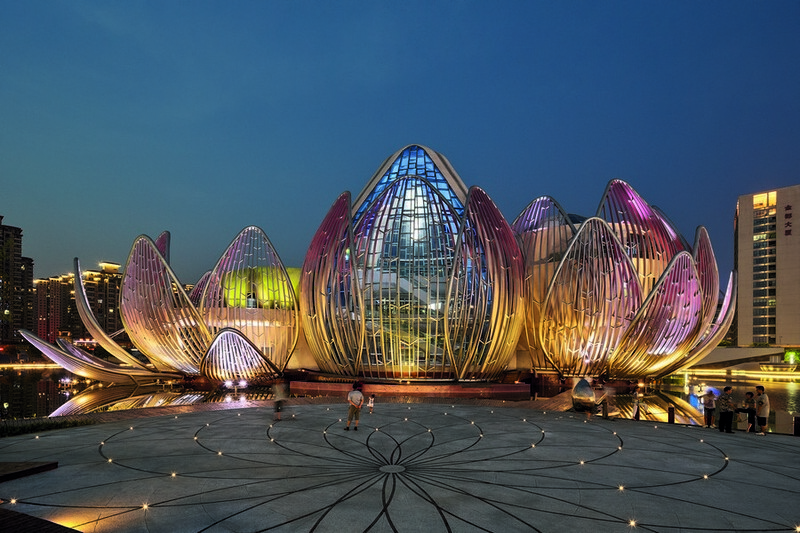 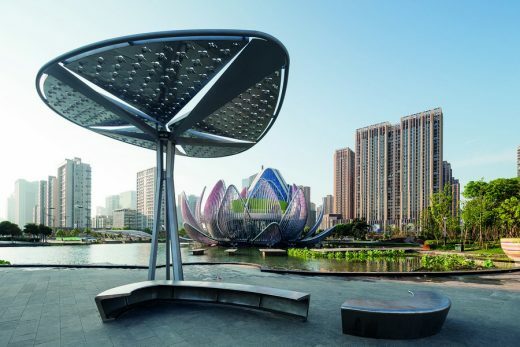 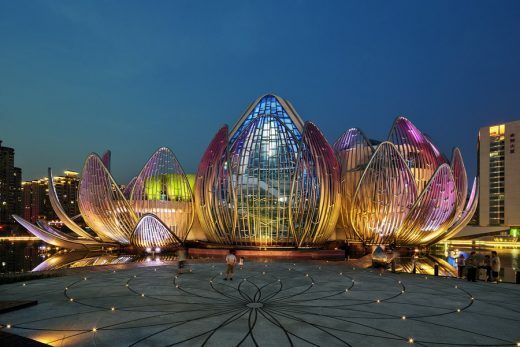 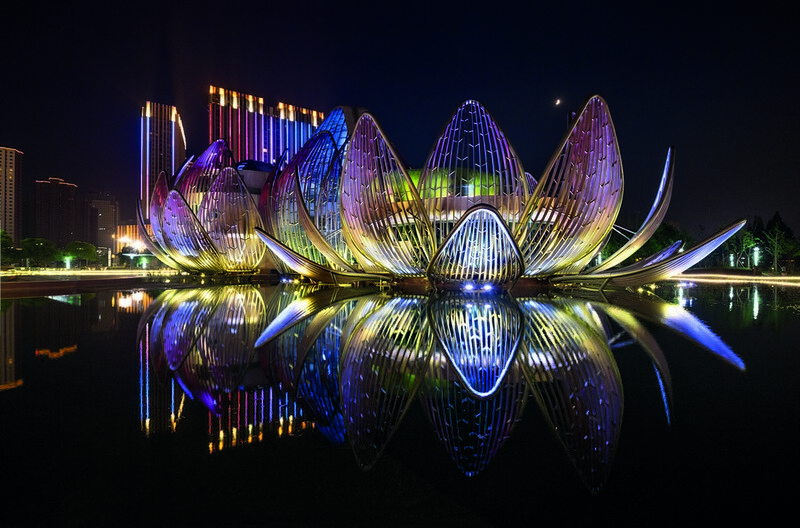 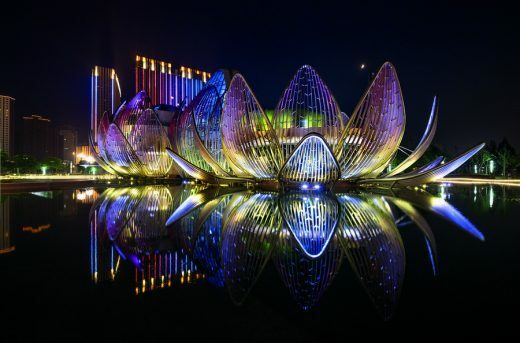 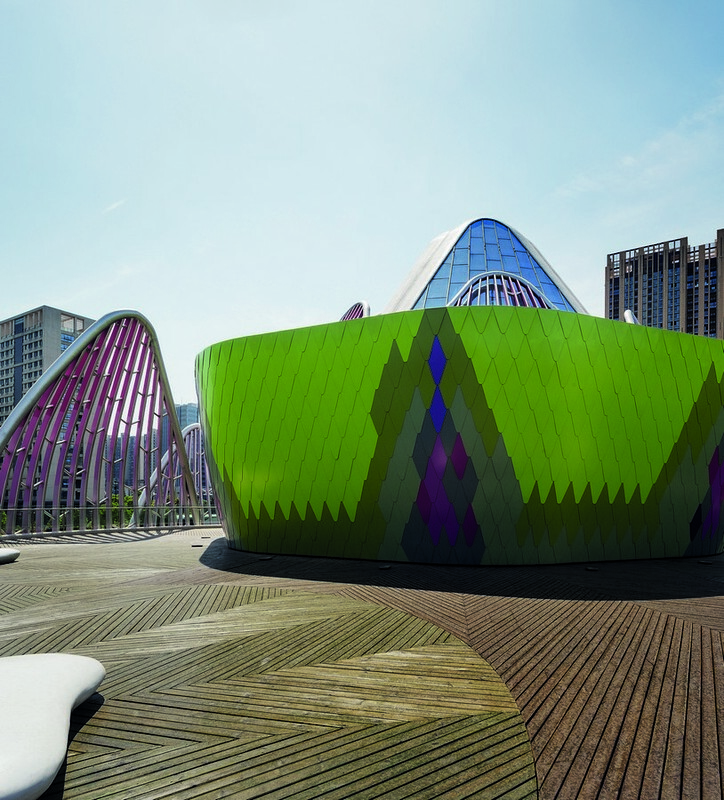 The Lotus Centre and People’s Park has become one of the most popular landmarks in Wujin with a sustained contribution to the social and cultural life of the city.